Seattle Gay News has a sweet tooth for alternative pop and rock music, and each week we share our favorites with the fun folks at Manray Video Bar (514 E. Pine) starting at 9pm. We invite you to join us tonight to see and hear the newest, coolest music videos from artists like Beck, We Are Scientists, Wolfmother, Franz Ferdinand, Goldfrapp, Head Automatica, Red Hot Chili Peppers, Guster, She Wants Revenge, Snow Patrol, Keane, and many more. Tonight we're premiering videos by Mellowdrone, Aqualung, and Primal Scream. No cover ever. Drink specials all night. The crowd is hip, fun and mostly gay, yet it's a comfortable atmosphere for your straight friends to join you for cocktails and great music. If you dig alternative sounds, this is where to be. 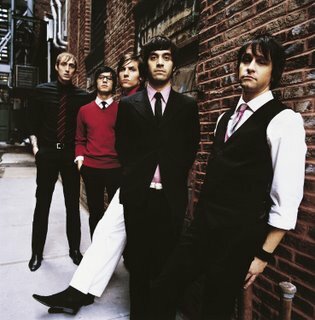 Photo of Head Automatica, taken by Janette Beckman and courtesy of Warner Bros. Records.